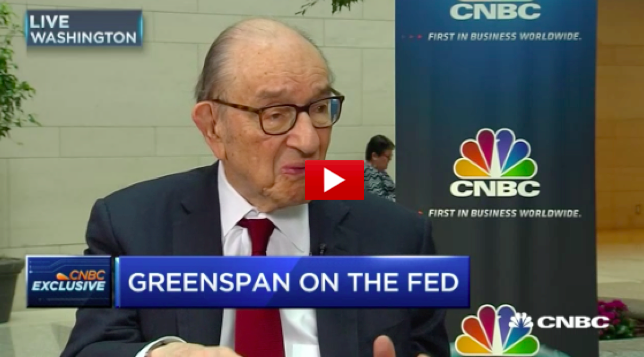 Greenspan: Stagflation is Here and Rising "Its a Fiscal Issue"
Former Fed Alan Greenspan discusses entitlements growing 9 percent a year and that no one wants to attack that. On Stagnation he says we have a slow growth economy where you end up with inflation and slow growth just like the 70's. When CNBC's Sara Eisen asked him "What can the Fed do about it"? His reply was " The Fed has really no say, its wholly fiscal issue"
At the IMF & World Bank Spring meetings, former Federal Reserve Chairman Alan Greenspan speaks with CNBC's Sara Eisen about tax reform, growth and the global economy.